Well, I finally made a couple entries for BeadStar! I didn't enter hearts, since Erin S. entered using one of my pendants. But I did want to take the opportunity to enter and try to make something special with some of my Artisan Accents. I make this for the glass category....I was pretty excited to have a chance to use my sea glass! 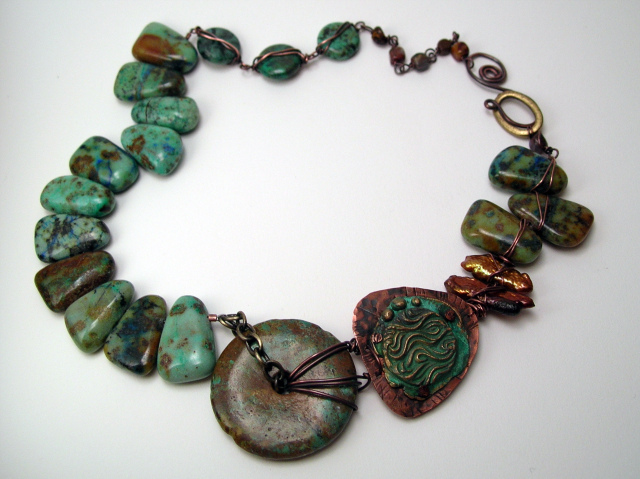 And I made this one for the gemstones category. Stefanie- send me an email with your address so I can get this heart to you!!! I will be leaving the sale for Artisan Accents on another week, and will be adding new stuff to the shop as well. It is 10% off orders with coupon code SLOblog10. Have a great weekend and thanks for all your great comments on here! I love getting to know you guys. They both turned out lovely. Thanks. I am not happy with my pictures, but I guess they will have to do. Photography is NOT my thing!! Thank you guys, for the encouragment! Jamberry_song, OH MY WORD! I am just so flattered to even have my name in the same sentence as Calder! 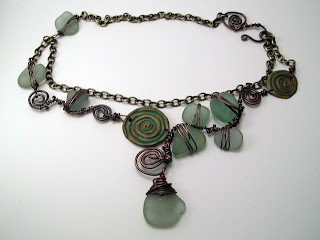 I have been making my swirls necklaces with sea glass for years, but always in sterling silver, and since I switched to copper wire, I just love the old earthy feel it has. So thank you, it made my day!!!! I recently saw his work on Andrew Thortons blog, and never even knew he made jewelry until then. Love him!